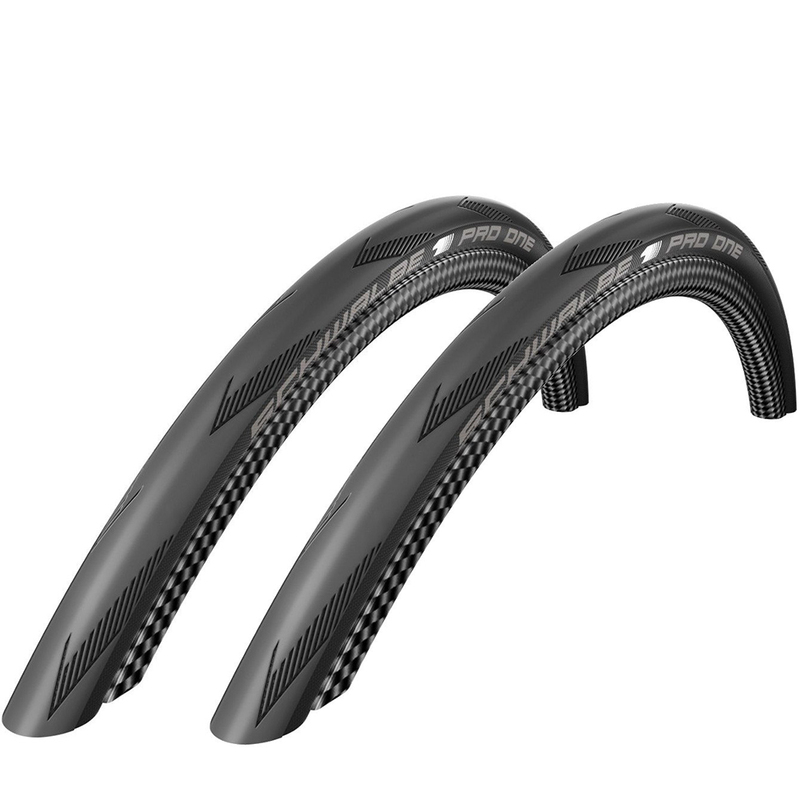 The Schwalbe Pro One MicroskinTL-Easy tubeless road tyre set includes everything you’ll need to run your road tyres tubeless helping you to benefit from lower rolling resistance, a more-supple ride, enhanced grip and decreased overall weight. With a patented Microskin construction Schwalbe’s Pro One boasts significant weight reduction and decreased rolling resistance while increasing puncture protection. To make your tubeless setup as easy as possible Schwalbe have put together this user-friendly kit which includes two 25mm Schwalbe Pro One tubeless road tyres, Doc Blue latex tyre sealant, Easy Fit sponge applicator and a practical tyre valve wrench. Great tires. Had to mess with one more than the other to seal, but I had them all done in a couple hours. Rides comfortable, smooth, and fast. Great value and came with everything needed for a first time tubeless user. Tyres run nicely and seem to have very little rolling resistance. I`ve been riding Conti GP4000S tyres for years. Grip wise these are a massive improvement in feedback and grip. No idea on durability yet, but looking good. Great tires. Relatively lightweight without sacrificing sealing performance. All tubeless materials included in box. I didn't believe that tubeless tyres could make a noticeable difference until now! These are subtle, compliant and very, very fast creating a sense of confidence! Been running the Pro One tyres for quite some time and covering a reasonable amount of km's each year. Very happy with the performance, loads of grip and good feedback when descending. Wear rate is acceptable for this softer compound tyre but not alarming, I much prefer to have the grip than the extra km's. Mounting the tyres onto my Giant SLR wheels is a bit hit & miss, even using the Schwalbe fitting kit! I suppose it very much depends on the wheelset...All in all, great performing tyres and at a decent price from Merlin for the kit! Firstly I would like to thank Merlin for the speedy delivery. I was in desperate need of replacement tyres and got them in the nick of time. As for the tyres, I cannot say I have put them to the test yet. I have done one 200km ride in soaking conditions. The tyres performance was first class. They handled the tricky wet conditions extremely well. No slipping what so ever. I was extremely pleased with how easy they were to fit on my rims. Having read many reviews about fitting tubeless, I was quite apprehensive about this process. Well I can say that I fitted both front and rear tyres without any hassle. So far I am very happy with these tyres. Moving to these tubeless are a revelation. Very low rolling resistance make it easy to reach top speed and hold it. This is my second set of Schwalbe Pro One 25mm tubeless tires. I am going to replace the rear soon as it is starting to get a little bit flat (instead of the normal rounded contour when new) from wear. Mind you, this is after nearly 4000 miles of riding on this tire. Pretty good I`d say. I ran this tire tubeless on a set of. Zipp 303 NSW wheels. Installation was easy.. I never got a single flat. My wife also has this tire in 28mm and also has not had a single flat. We both use Orange Seal. These tires ride really nice with excellent grip on cornering. Look for the 2-pack when purchasing as it represents the best value. Accurate description as these were easy to set up tubeless. Tyres were super tight on the wheels but not sure if this was the tyres being small or the rims big. On wide rims these tyres came up about 27mm wide. First 100km has left a good impression of on road tubeless. Used this tyre in an ironman race and a granfondo race. It rolls well and also sticks well in technical descent turns. Very good price point! Was nearly reduced to tears mounting these to a set of 35mm carbon rims. Apart from that hiccup, I`m very happy with these tyres. Fast, grippy, look good. This is my 4th set of these tires. They hold up well on regular roads, but wear fast on gravel roads. Very fast and smooth. No issues mounting or inflating. Super tires. I've been using them for years. Been using the Pro One tyres on both my bikes now for quite some time. Love the feel of these tyres compared to my earlier Giant Gavia tyres. There is a trade off as the Gavia's were harder and therefore lasted longer but with less grip or feel. The Pro One's are softer, grippier and therefore wear faster but give so much more feedback. This transpires into more confidence when cornering or descending, this is a priority for me, more so than the extra mileage! The reason you stay with tubeless once you've made the switch.... Increased grip (particularly good), comfort (tubeless) and peace of mind that a thorn or a pinch won't get have you calling the "fun moderator" for a lift home at 0630 on a Sunday morning. If you hit a piece of flint with less than 55psi, expect to have to use an "innovations"-"sticky anchovy/thingy". Anything but a sidewall slice should otherwise be ignored and cycling continued. I now carry a small bottle of sealant in my repair kit (59ml) and innovations "anchovies" instead of a tube, CO2 & inflator chuck. Yes, I recommend these tyres. Only fitted tubeless during my mechanic training so this was a 1st doing it for myself. Went really well and was straightforward. Was a bit concerned not having a compressor for the inflation fit. I do have a good track pump and this worked a treat. No issues so far 1 week after the fit.